Written by Colin Nederkoorn on June 4, 2014 . 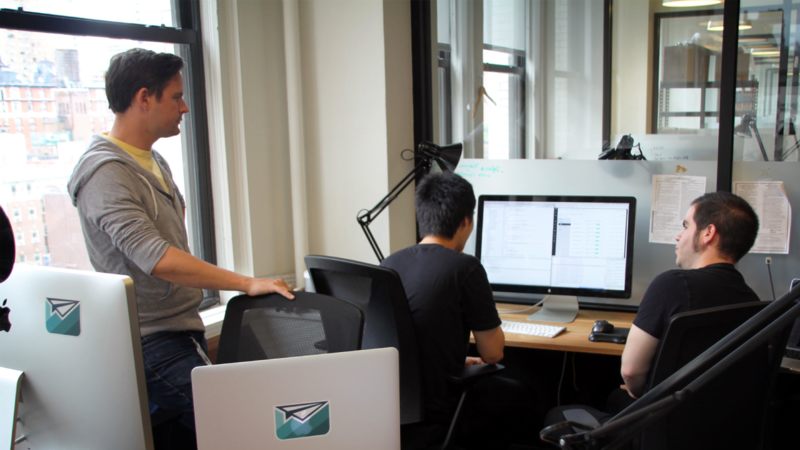 In December 2013, all full time employees at Customer.io were in the same office in New York City. Late last year we tried a 2 month experiment with remote working and had great results. This gave us the confidence to decide at the end of 2013 to make it ok for people to be distributed. We made that decision public in our Annual Report and many people have been curious about how our experiment has been going. 5 months in to 2014, we’re now a distributed team. Our team of 7 might be anywhere in the world. I’d never know and I have no idea whether or not they wear pants when they work. It has been a tremendous experience to learn how to work together remotely, and how to hire remote people. We have some “gotchas” to share with you too. Here are some of the things we’ve learned. When we’ve posted on the job board WeWorkRemotely, we’ve received interest from extremely talented people. For example, when we posted for a Senior Front End Engineer, we received over 50 applicants. Of those applicants 3 – 5 were local to New York. Having lots of quality candidates creates a different problem than what tech companies are used to. We end up turning away a lot of people who in other situations would probably get the job. We also attract people who want to leave their current job for personal reasons. People who no longer want to commute, or want to spend time with family, or want to travel and see the world all apply interested in the freedom working with us provides. Remote teams grant people a lot of independence. If people have the internal motivations to do great work, they’re more likely to be successful in a remote team. After our team retreat in Barcelona at the end of March, I stayed for another week to spend time with John. Walking around the alleys in Barcelona, we realized that we hadn’t talked about the business since he started traveling in January. There were business decisions and issues that were unresolved. We used to chat about them casually over lunch or when grabbing coffee from the kitchen. Over that week we did a lot of talking and made some hard decisions together that impacted the business and the team. The lesson there was that we needed to force ourselves to talk more. Since then, we’ve been having an open ended video chat on Saturday or Sunday where there’s a loose agenda and we talk about whatever’s on our mind. Casual discussions are the most valuable thing you can accidentally lose when becoming a remote team. We’re also making sure that we meet up in person for a few days once a quarter. When a deploy goes out, a message is posted to the #deploys channel. When we get a new support ticket, that goes in to #helpscout. Off-topic or fun things get shared in the #random channel. 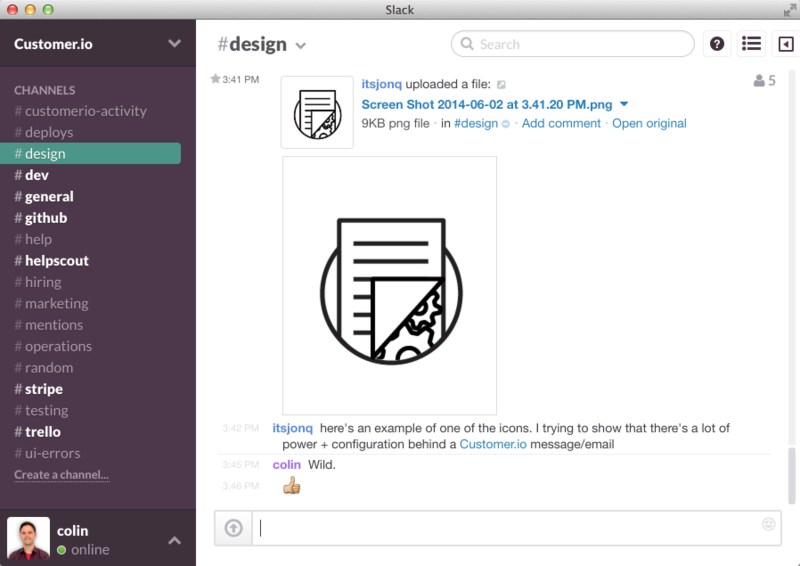 Slack gives us a handy way to see what’s happening across the business. My recommendation: Turn off pop up notifications. We use Trello for engineering tasks, Quickcast lookback for short screencasts of things we’ve built / bugs, Hackpad Dropbox Paper for sharing ideas, and Draft for writing / proofing blog posts (like this one). The goal with all of these is that the recipient can choose when to look at them. They don’t force people to stop what they’re doing and pay attention to you. The one synchronous communication we had was a daily standup at 11am Eastern time on Google Hangout. This was early (8am) for people on the US west coast, and could be quite late for John (depending on where he is). As we added more people to the team, the daily standup became less useful. If I didn’t prepare for standup, I would do a poor job of explaining what I was up to. Sometimes when other people were talking I found myself tuning them out if they rambled (sorry!). Last week we decided to replace the daily standup with iDoneThis (asynchronous ftw) which makes it easy to fill in what you’ve done during the day and then shares it with the team at the beginning of the next day. Beyond iDoneThis, it’s up to people working together how they want to work together. There won’t be a company-wide check in each day so it’ll be all text by default, unless people organize their own standup. Without the standup, we would have no regular face to face (video chat) with the whole team. To address that we’re trying a weekly Google hangout on Friday. This is the first week and the goal of the hangout is conversation as a team without an agenda. Having a calendar event for “team socialization” seems forced. We’ll see how it goes. I’m optimistic and hope that it starts to feel natural and people look forward to it each week. Even with all the great tools today, you can’t beat the richness of being in the same room with people. We did one company retreat this year, and I’d like to have another one later in the year. Another strategy we’ve implemented is when we hire a new person, there’s an opportunity to meet people they’re working closely with in person. We recently brought Jon Q from Toronto to NYC to work with me, and Alvin from Boston to NYC to work with Henry. We created a company that gives each person on the team the ability to choose where they live and how they work. Making the company remote gave John, my cofounder the freedom to go and travel for a year while working. Making the company remote is giving me the freedom to leave New York and I’m excited to be moving to Portland, Oregon in a couple of months. After making this huge change, would I ever want to move back to everyone in the same place? I don’t think so. If you’ve got a remote company, what advice do you have for us as we grow? If you’re thinking about joining a remote company or starting one, what questions do you have for us? Curious about what this remote team of ours does? 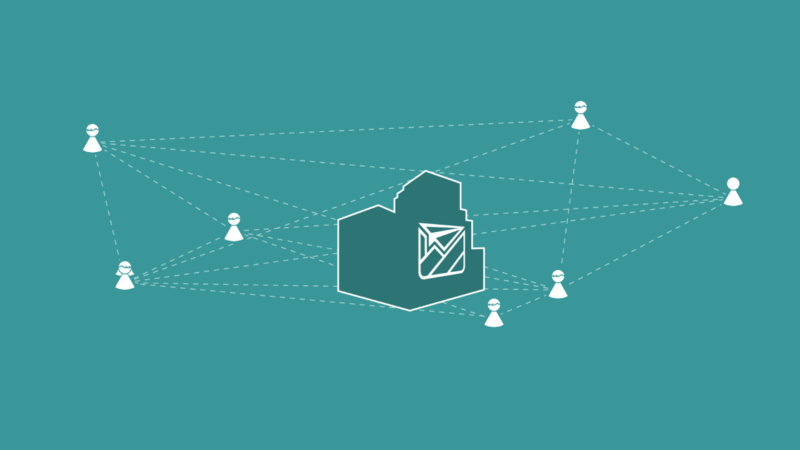 We make Customer.io, a platform for sending targeted messages based on what people do or don’t do.